Maple Walnut Blondies are perfectly chewy and studded with walnuts for the ultimate fall treat. I live with the Ebenezer Scrooge of desserts. Boyfriend does not particularly like sweets. In fact, my baking escapades usually result in him crinkling his nose at me suspiciously. Rarely do they result in him eating whatever I have made. As a baker, this can be more than a little annoying, particularly when I need a taste-tester. As an eater…hey, more for me. In light of this situation, my friend Cindy has become my primary dessert taste-tester. Nevermind the fact that she is a personal trainer, girl can taste-test sweets like none other. Recently, she asked me to come up with a recipe for Maple Walnut Blondies, inspired by the seasonal ones at Trader Joe’s. Since she so willingly tries everything I bring her, I figured that the least I could do was provide her with a recipe for Maple Walnut Blondies so that she could make them even after they are “out of season” at TJ’s. It took me about three tries to get this one right, but in this case, I’d say that third time’s a charm. 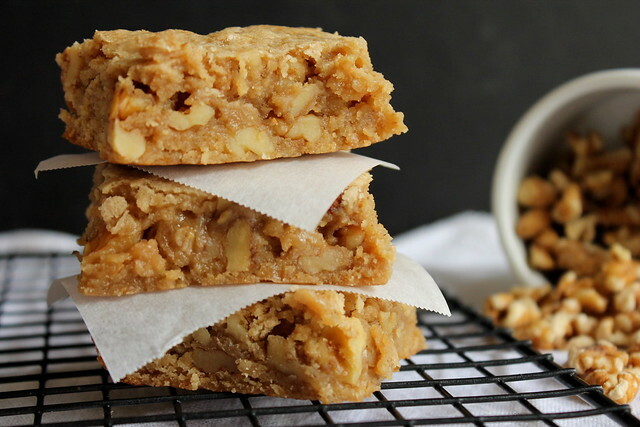 These blondies are perfectly chewy, mapley, and studded with walnuts. They’re my favorite fall flavors, jam-packed into one perfect bar cookie. Even though I shared half the batch with Cindy, I had no problem putting away the other half of these by myself, no help required. Preheat oven to 350 degrees. 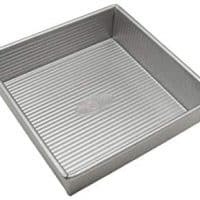 Grease an 8x8-inch pan and line with parchment paper. Set aside. Place the oats in a food processor and pulse until coarsely ground. Set aside. In a large bowl, whisk together the butter and brown sugar until slightly lightened in color. Add in the syrup, egg, and vanilla, and whisk until thoroughly combined. Using a spatula, stir in the ground oats, flour, and salt until just combined. 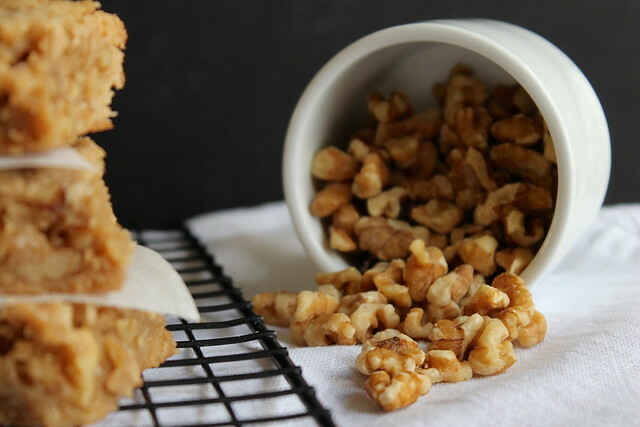 Fold in the walnuts. Pour batter into the prepared pan, spreading evenly. Allow to cool in the pan, then use the parchment paper to lift the blondies out the pan. Cut into pieces and serve. Store in an airtight container for up to 4 days. UGH these things look like they’re SO worth the triple effort! When a baking recipe doesn’t work out for me the first time, I tend to just throw in the towel, so nice work sticking to it! Boyfriend may not be huge into sweets, but a little birdy told me he can grill up a mean piece of meat, and that’s worth its weight in gold! 🙂 I want a stack of these at arms-reach at all times! This is true. Little birdy was quite right. Now we just need an outdoor space to keep a grill! I cannot even imagine that, says the gal who has sugar coursing through her veins. I would eat about 5 of those without batting an eye. I did eat about 5 of these without batting an eye. You can borrow Mike for a week or so to be your taste tester. I am sure with his cookie monster status he would gladly comply. Plus, we are just about to run out of Oreos so he will be so hungry for cooooookkkies! But for real this blondie looks to die for. I am new to the whole blondie thing but I seriously love them more than brownies! I just finished making these. Probably should have let them cool a bit more, but we were hungry. Three of them are already in our tummies. I’m guessing by the end of tomorrow, there might not be any left at all. 🙂 You know, the family is going to go between horror and delight at the news that he isn’t much on sweets–horror that someone exists like that and delight that there is more for them. OK so these look amazing. And just let me know whenever you need someone to help you taste test next time and I’LL BE THERE. Just like the song. I would happily taste test these! Love that you used maple syrup. 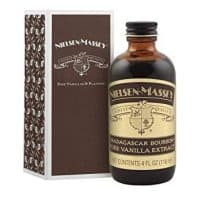 So many people use maple extract which I think is rather gross. My dad never used to like sweets, but now he loves to try the things I bake. Awwwwww! SSSS…I am beyond honored to be mentioned on your blog! 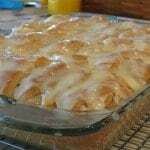 I can not wait to make/bake my ultimate favorite! I thank you immensely for deconstructing & reconstructing the beloved TJ’s maple walnut blondie brownie! I am forever grateful to you as I can now enjoy them 365 days a year! Luv being your taster, thank you boyfriend, Lol! Thank goodness indeed! Whew! LOL! Because you know I was! LOL! What IS it with men who have to be harassed to eat dessert?? You’d think I was giving Ben Robitussin, the way he acts about my requests that he try my desserts. Your friend Cindy is one lucky lady, and I am pinning these maple bars of wonder to bake ASAP. If Ben won’t eat them…more for me! Mwahahahaha. This is seriously the best Fall dessert. I may just have to whip these up for my Bible study nest week. TDF! I thought about taking these to my church group this week, too. I hope everyone enjoys them! Ummmmm, yes, I’ll take twenty thaaaaank you! 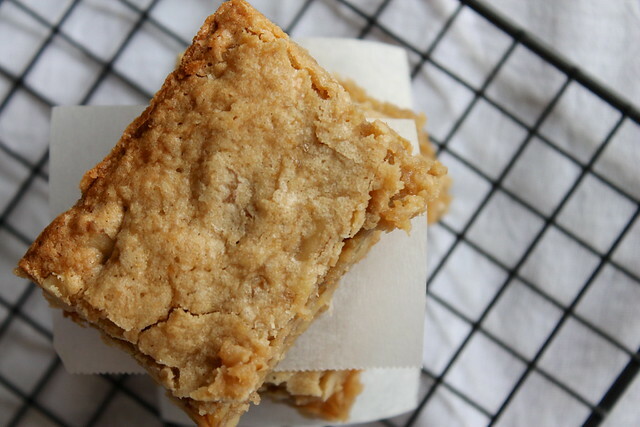 I’m not big on regular brownies, but blondies are numero uno in my book! Add maple and I’m basically passed out from disbelief. I’ll be trying this.. oh yes. 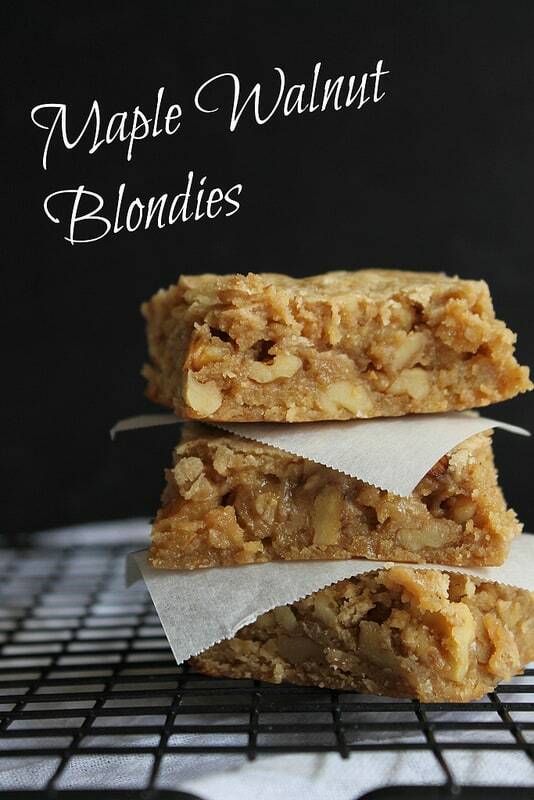 Seriously, what IS it about blondies that are so addicting?? I think it’s the gooey centers. Gets me EVERY time. Delicious recipe!! Thank you so much! Living in Québec, and this being the time just before the maple season, there was a huge sale of last year’s maple syrup this week. So I bought a ton of it, and used some to make maple sugar (surprisingly simple : http://www.backyardchickens.com/t/148932/maple-sugaring-making-granulated-maple-sugar) and used it instead of the brown sugar called for in your recipe. Holy maple!!! For good measure I topped the blondies with maple butter… Triple maple madness!!! But definitely could not have achieved such delicious results without your perfect recipe proportions! 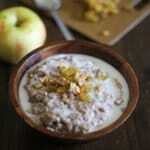 The texture is peeeeeerfect, and the oats add a subtle nuttiness that complement the walnuts beautifully. Thank you very much for sharing! I admit that they were… Took them to a recording session with a large group of guys, they flew of the table! Thanks again! I was just at TJ’s looking for these. My husband was given a package of them, ate them and asked for more. Alas, they are ‘seasonal’ and none in stock ’til next ‘season’. So I hunted online and Lo & Behold! Here you are with a great recipe for me to try. I’ll let you know how he likes them. Also, I’m not the type to figure out a recipe based on the back of a package. So I’m grateful for your hard work. Can’t wait to hear how the GF version turns out! Hi there! The GF version was perfect! I wasn’t to worried as most brownie/blondie-type cakes require little flour to start with and tend to be denser regardless. Instead of the 1 cup of wheat flour, I used 1/2 cup processed oatmeal (on top of the 1/2 cup already used in the recipe), 1/4 rice flour and 1/4 almond meal. I added 1 tbsp. xantham gum (a standard GF flour mix additive which mimics gluten and helps things bind together) as well as a heaping tsp. 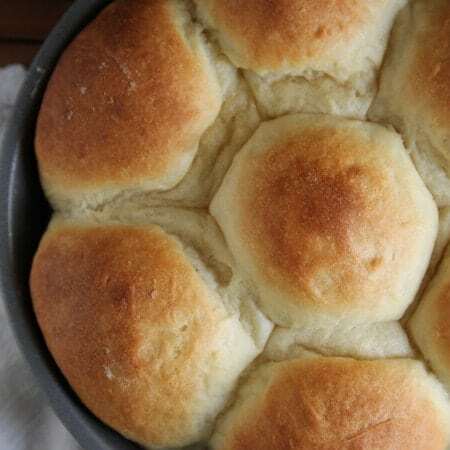 of baking powder, which helps counteract the tendency for GF flour mixes to “pack tightly” and yield a denser texture. The oatmeal taste was stronger, which no one minded, as its nuttiness complemented the walnuts well. And as before, I used maple sugar instead of brown sugar, and topped the blondies with maple butter, which makes a beautiful and intensely mapley frosting. I also sprinkled a bit of fleur de sel to offset the sweetness. Thank again for the recipe, I couldn’t have achieved such great results without your initial hard work. I appreciate your dedication to precision and your very inspiring blog! 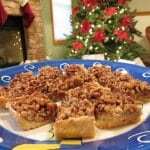 My husband loves Maple Blondies! I look forward to trying these. They look yummy! Thank you for linking up with Foodie Friends Friday! Hope to see you next week. 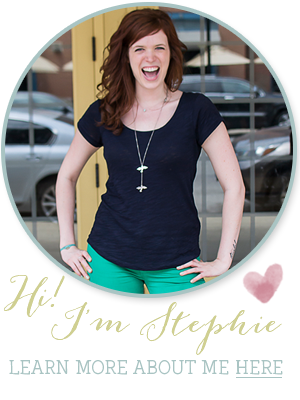 Hi Stephie! You’re being featured this week on the weekend social for most viewed recipe this week! Come back by and link up @KicthenDreaming.com and congrats. This is absolutely beautiful! I’ve never had the Trader Joe’s version, but these look awesome! I can’t imagine they would last long here! Pinning! Thanks for sharing at Foodie Friday’s. These bars look amazing. Shared on my FB page this evening and pinned too! 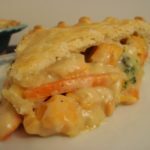 I just found this recipe and gave it a try. Due to acid reflux, instead of butter I used butter substitute Earth Balance. They came out GREAT. Thank you so much for putting in the time and effort to perfect this recipe. It’s a keeper at our house. I know I am late to this blondie party, but I have a question. 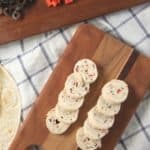 If I use oat flour instead of grinding oats, how much oat flour should I use? Oddly, I’ve never actually measured the end volume of the ground oats – maybe around 1/3 cup? I will eat just about anything that has maple and walnuts in it…fudge, sundaes, cake, pie, and blondies. Thanks so much for the recipe. It is a pretty great combo, isn’t it? These look so delicious. Pinning to try the recipe. Thanks! I’m going to try this with instant oats since I have a lot that I don’t usually like eating, but if you are already grind the oats, it seems it’ll work? 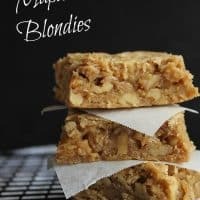 I’m so happy I found this because these blondies from TJ’s look amazing but I love to bake so I usually don’t let myself buy too many baked goods at the store! My first attempt at maple walnut blondies was a King Arthur Flour recipe. They usually have great recipes, but their recipe was dry and more cake like than chewy. They shattered when I tried to cut them, too. So I googled, and your recipe came up 3rd one down the list. 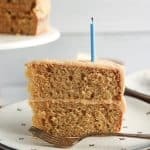 This recipe is just perfection! I think the oats probably make it moist but chewy. The only thing I changed is using 3/4 cup of walnuts instead of 1 cup. Tried to cut calories, but still wound up at 118 calories per ounce. But so delicious, and I had no trouble cutting them into neat little squares. I don’t know if you do your own photography, but it is great, too. Your blondies also looked much better than any others I’ve seen. This one is a keeper! The ingredients say rolled oats but the instructions say ground oats. Which is correct? 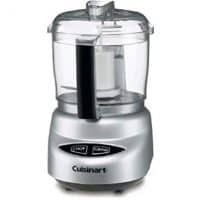 Both – As noted in the instructions, you’ll pulse the rolled oats in the food processor to achieve the ground oats.